The primary motiviation for people visiting a business's Facebook Page is to locate an incentive - what is the company able to offer me as a consumer? A big hang-up for businesses wanting to use the power of online group deals and coupons is that they lose up to 50% of any revenue they make from their deals to the online providers providers, such as Groupon, and LivingSocial or Google Offers. Facebook Deals syndicated partners take similar sized commissions but the return to business is that they, and the major providers mentioned above, can offer vast distribution power. There are now new alternatives for SME's and companies to offer online deals without using the major providers and paying such a large chunk of their revenue as a commission. If you have a large fan base already then then you might well consider using them. Thrusocial has drag-and-drop functionality and easy distribution to Facebook and Twitter. Thrusocial's four pricing models range from the free option to a full enterprise solution for $US1,00 per year. For most though their Premier plan at $US34.99 per month will suffice, as it includes the coupon creator and a 30 day free trial. It is worth having a look at their showcase and they also provide a Message and Promotion Centre where you can automatically create promotion campaigns with landing pages that live on Thrupons.com. These in turn are automatically promoted in updates published by the app to your Facebook Page and Twitter account, getting rid of the need for time-consuming manual promotion. Another option is FaceItPages which features an ecommerce storefront app; you can sell your merchandise from your Page as well as proving deals, but it has fewer distribution options. Their Promo module allows a compnay to provide a special offer, discount, or giveaway and it appears that it is included in their Premier plan for $US15 per month. In their application you are able to link the buy button to your buy url and control what text the buy button has on it. According to FaceItPages, the coupon app. is best used with their reveal content module, which allows you to display different content to fans versus non fans. This gives an added incentive for non-fans to sign up. 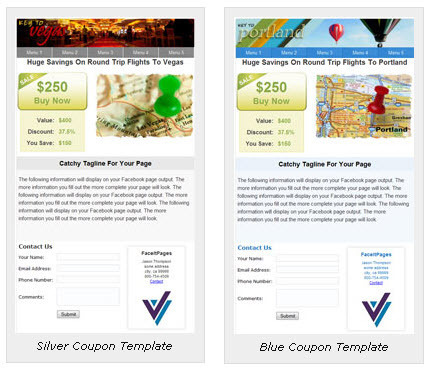 They offer a couple of pre-designed templates (below) to make the coupon offers an easy exercise. Examples can be viewed here. So is using an alternative coupon provider worth the investment consideration? For those with a proven social media profile and a large fan base the answer is probably yes. For the smaller company at the online coupon 'starting line' you may still need the vast distribution network of Groupon, Google Offers or similar, to extend your reach / scale up your offer.